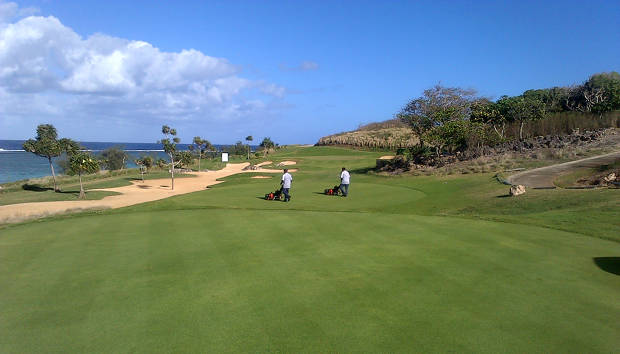 A new fleet of Jacobsen turf maintenance equipment has been delivered to Natadola Bay Golf Course, just in time for the final preparations for the inaugural Fiji International tournament, co-sanctioned by the PGA Tour of Australasia and OneAsia, the providers of high level playing opportunities for all leading golfers in the region. Designed by Fiji’s Vijay Singh, the course opened in June 2009 and shortly afterwards hosted the Fiji Open. Subsequent high profile events have included the 2010 Fiji Open, the 2011 Nomura Cup – the Men’s Asia-Pacific Team Championship – and in 2012 the Natadola Bay Fiji Classic. The Fiji International is the third new event to be added the PGA Tour of Australasia tournament schedule in the past three years and the first to be televised internationally. “With TV coverage hitting 40 countries, it puts a lot of pressure on the team to have the course in brilliant condition. Most of my guys are local Fijians and this will be their first exposure to televised event. They are really excited and to get their hands on this new Jacobsen equipment is a real bonus. Ten Jacobsen GK522 walking mowers were used to cut the greens, mowing at 3mm; the tees, collars and aprons will be maintained at 5mm and the Jacobsen LF550 light fairway mowers were cutting at 10mm. The primary rough was mown to 25mm and the secondary roughs to a height of cut between 50mm and 60mm. Seaisle Supreme paspalum was used exclusively on all playing surfaces. The Natadola Bay Golf Course is located on Fiji’s stunning Coral Coast with spectacular views of the surf tinged beaches. Owned by the national pension provider, Fiji National Provident Fund, Natadola’s 18 holes measure 6,569 metres from the Pro tees with elevation changes of 86 metres.